Some Christians believe that if they go to church on Sunday and get their ticket punched, what they do the rest of the week doesn’t make that much difference… as long as it’s nothing too bad. If they don’t kill anyone, or throw widows out of their homes… they will be alright. Is this the case? Are there rules for life? Do they apply to everyone, everywhere? Let’s think about this a little. 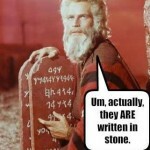 Did the Ten Commandments really tell us things like: Thou shalt not steal… unless your really need, or want, the money? Or Thou shalt not bear false witness… unless the guy is a real stinker and you can get some out of of it? No! In a world infested with moral relativism, the real positions seem to be rather narrow minded – unaware of the times. Yet, the times are not treating us so well… are they? However, the same creator that gave us life and granted us unalienable rights also told us to love our neighbor as ourselves. Loving our neighbor as ourselves gives us a whole new perspective on the world around us. We are not just hear to grab as much as we can for ourselves, but to create an environment where everyone can flourish. Beyond this, the Cultural Mandate we are given at the end of the first chapter of Genesis tells us to cultivate and subdue the earth. This means we are to use it and take care of it as good stewards. There is no indication we are to become subservient to it or worship it as a competing god. Understanding all this, and taking the book of James seriously when it tells us we are to put our beliefs into action rather than merely giving them mental assent drives us to become involved in the world and society around us. While there are some differences among us since we are not robots marching in lockstep, often our Christian faith drives us to take with sobriety the admonition to watch over the weakest among us us… which means standing up for the unborn and the aged. We look out for our neighbors, as ourselves, that their resources aren’t squandered by a profligate government. We are wary of a government that seeks to make itself the supplier of all our needs and the object of our dedication and affection. We are concerned when our school systems seem to be determined to inflict the religion of secular humanism on our children and the children of our communities while blocking any recognition of the faith upon which our country was founded. We understand that we, ourselves, are to be charitable, helping the needy, and that pushing the job off to an valueless government, paid for involuntarily by our friends and neighbors, will not fulfill our responsibilities nor will it meet the real needs of the recipients. Some of us feel the need to pursue one area or another as we are led in our own unique directions and work out our salvation with fear and trembling. We would all do well to look into the life of Dietrich Bonhoeffer, a Lutheran pastor executed for speaking the truth and helping Jews escape from Nazi Germany. How many of us, this writer included, would be able to follow our convictions to that extent? Some would like us to stay behind our church doors… even some of our brothers and sisters. There are some real prayer warriors in the world, but for most, the offer to pray about a situation is an excuse to avoid the work and conflict of the Christian in society. It is a work that must be done, however, and a challenge that must be met. My hope is that you will join us as we seek to be Christs hands and feet in our world.